Karen has been sharing stories for over 30 years. She has performed in libraries, camps, churches, parks, schools, historic sites, festivals, and even on a stage floating in a lake in a cave. Karen has taught the “Art of Storytelling” at Ulster County Community College and “Discovering the Stories Within Us” at Ulster Performing Arts Center’s Expanding Horizon’s Art and Education Center. Karen was selected as a National Arts Education Fellow for her storytelling program: “There’s No Place Like Home: Stories of the Hudson Valley and Catskill Mountains. In 2002 she was named Kingston, New York’s official Storyteller Laureate in perpetuity. Holding a MS in Early Childhood Education, Karen combines her 33 years of teaching experience with the art of storytelling, to work with teachers in elementary schools, giving workshops and visiting classrooms. Her workshops include, but are not limited to, “Once Upon a Time: It CAN Happen in Your Classroom, Community Storyteller: Drawing the Community Together through Story, Storytelling with Poverty in Mind, and The Mindful Storyteller. She has presented these workshops in the United States, Newfoundland, Canada, and most recently in Sydney, Australia. Each summer Karen travels throughout NY State with her summer themed library programs. This year she is ready for “A Universe of Stories”. Karen is co-founder, along with Lorraine Hartin-Gelardi of Tall Tales/Short Story Productions which has produced Tellabrations, along with other storytelling programs in Kingston, NY. She is regularly featured at Mohonk Mountain House, a historic landmark hotel in New Paltz, NY where she will be celebrating 25 years of telling in 2019! Karen is on the Board of Advisors of the Multifaith Storytelling Institute. Her newest work includes working with people in recovery from drug and alcohol addiction at Villa Veritas in Kerhonkson, NY. Her most rewarding work to date. Her first CD, “The Crone and Other Lives I Have Lived” has just arrived and Karen can’t wait to share it! Click here for newspaper articles about Karen. 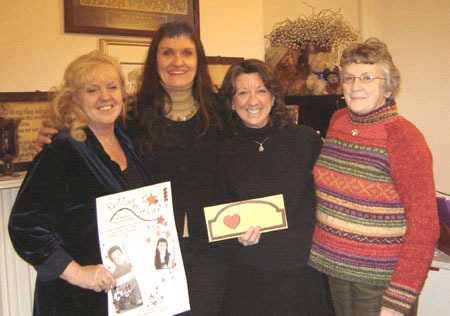 Tall Tale/Short Story Productions (AKA Lorraine Hartin-Gelardi and Karen Pillsworth) donate proceeds of Tellabration 2009 in the amount of $800 to The Children's Home of Kingston. They are pictured with Patti Habersaadt, Director of Development (on left), and Gwen McCann, Director (on right).